The new and improved Original Grill Gauge; propane tank scale is a must for owners of gas grills, Patio Heaters and Mosquito Misting systems. The Grill Gauge; accurately measures the propane in your tank, without batteries or any other power sources required. It uses the most reliable method of measuring propane, which is by weight. Grill Gauge continues to innovate, the new and improved Grill Gauge has a redesigned dial as well as an exclusive “Auto Check Indicator”. Simply hook the gauge to the tank and lift the tank off the ground only a few inches. Place the tank back on the ground, unhook the grill gauge and read the dial. The “Auto Check Indicator” stays in place to show you how much propane is in your tank, to recheck or check another tank simply reset the dial back to empty and repeat the process. Competing products require you to lift the Gauge and tank to at least waist height to read the dial. 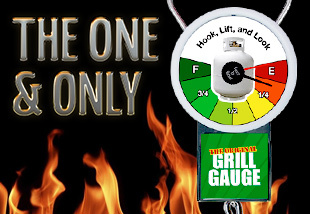 Easy to use, dependable and durable, the Grill Gauge; will Never Leave You Guessing, so you never run empty again! The Original Grill Gauge works on standard 20 lb. tanks, which means a standard tank will safely and legally hold 20 lbs. of propane. As of late propane tank exchange companies have labeled their tanks as 15 lb. tanks. This is their way of complying with a consumer lawsuit that rightfully claimed that these exchange companies were misleading consumers by only filling the 20lb standard tank with 15 lbs. of propane. The grill gauge will work on these tanks that are labeled 15lbs, our gauge shows that these tanks are approximately ¾ full which is accurate. To save money on propane and get maximum grilling time from each tank, refill your tank instead of exchanging. Take your Grill Gauge with you to make sure you get a full tank. "The Grill Gauge is simply the best! Very easy to use and extremely accurate. No more ruined barbecues! Where was this product last Thanksgiving when I ran out of propane halfway through my fried turkey? Well worth the small investment." - Mike J., Roswell, GA.